FOREIGN TALENT FOR FINNISH COMPANIES International student concerns about finding a job are shared by many foreigners living in Finland. Language and cultural barriers can be difficult to overcome, and foreigners may lack the informal connections and job-market exposure that can lead to employment. Hanken is tackling this challenge head-on with HIT, an initiative running since 2017. Guided by a personal mentor at participating companies, students experience professional development and personal growth parallel to their studies, while the companies benefit from the students’ skillsets and international perspective. HIT is now well established at Fazer, KPMG, PWC, Stora Enso, Wärtsilä and several other companies. 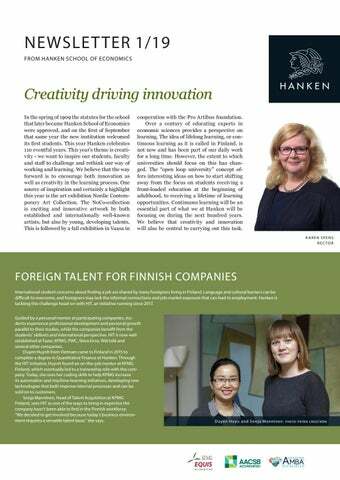 Duyen Huynh from Vietnam came to Finland in 2015 to complete a degree in Quantitative Finance at Hanken. Through the HIT initiative, Huynh found an on-the-job mentor at KPMG Finland, which eventually led to a traineeship role with the company. Today, she uses her coding skills to help KPMG increase its automation and machine-learning initiatives, developing new technologies that both improve internal processes and can be sold on to customers. Sonja Manninen, Head of Talent Acquisition at KPMG Finland, sees HIT as one of the ways to bring in expertise the company hasn’t been able to find in the Finnish workforce. “We decided to get involved because today’s business environment requires a versatile talent base,” she says. Duyen Huyn and Sonja Manninen. Quantitative Techniques for Economics and Management, QTEM, is a network that gives students valuable international experience and contacts. Students at master’s level can go on exchange for one or two semesters within the network, and perform an internship, possibly abroad. On top of the MSc degree from the university, they also get a certificate from the QTEM-network. On 7 March, network initiator Bruno van Pottelsberghe visited Hanken. – QTEM is also a good alternative for students wanting to take their master’s degree at a university other than their bachelor’s degree one. A typical QTEM-student has been in two-three countries, completed an internship and finds a job very fast after graduation”, continues van Pottelsberghe. The QTEM-network consists of 24 universities in 17 countries, and is looking to further expand. This year 360 students are a part of the network. KICK-OFF FOR A UNIQUE INTERNATIONAL COURSE Tackling World Challenges is a unique course collaboration between three business schools; Hanken School of Economics, Stockholm School of Economics and USI Lugano in Switzerland. 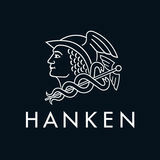 On 16 February, participants from all three universities met in Helsinki for a kick-off at Hanken. During the course, the students work together in groups with participants from the other universities using digital platforms. –The idea is that the students learn to work with people located in other countries, common enough in companies today. They learn to solve big challenges and they learn how to collaborate with companies in a concrete way. The course is highly demanding, but also extremely useful for the students, says Liisa Välikangas, one of the masterminds behind developing the course. This year’s Anders Wall scholarship is awarded to Hanken student Frans Westerlund. The scholarship of 125 000 SEK was awarded during a festive ceremony in Stockholm on 11 March. In addition to his studies at Hanken, Frans Westerlund is a cofounder of Nordic Sales Crew, where he also works. They are specialized in direct marketing and the company has grown significantly during its first two years. Nordic Sales Crew has around 100 employees in five offices around Finland. For many staff members, this is their first job and the company vision is to create a leading sales academy. –To be awarded this scholarship is a great recognition of many years of hard work. It certainly increases my credibility as an entrepreneur, with the added benefit of widening my network, says Westerlund. I’ll be using the scholarship to invest in the business – and for my own personal development, he continues. NEW AREAS OF STRENGTH ARE INTERDISCIPLINARY The Board of Hanken decided on new Areas of Strength for the next five years. Defining Areas of Strength is a way to show which areas of research are particularly strong for Hanken and clearly indicate to all stakeholders what Hanken has chosen to focus on and invest in during the coming years. The four new Areas of Strength are Competition Economics and Service Strategy; Financial Management, Accounting and Governance; Responsible Organising, and Leading People for Growth and Well-being. “This time we decided that the Areas of Strength can be interdisciplinary, or more focused sub-disciplines within the subjects or departments”, says Jaakko Aspara, Dean of Research and Innovation. KUN HUANG RECEIVES AWARD FROM EUROPEAN PARLIAMENT Hanken researcher Kun Huang received the European International Women Leadership Award 2019 at the European Parliament in honour of International Women’s Day in Brussels. The award is given by the European Parliament, and pays tribute to outstanding achievements of outstanding women. According to the award statement, Kun Huang receives the award for her success in a field where there is a male dominance. She was one of eight women to receive the European International Women Leadership Award 2019. “I am grateful to the European Parliament for organizing such an important forum on this remarkable day, International Women’s Day. I am greatly honoured to be included in such a group of outstanding women”, says Huang. Eight women received the award, Kun Huang 4th from the right. HANKEN & SSE PRESENTED INTEGRATION PROGRAMME DURING WEF IN DAVOS Rector Karen Spens participated in a panel debate concerning impact investment at the annual Swedish lunch event at the World Economic Forum in January. The integration programme Business Lead, created and run by the Financial Times-ranked Hanken & SSE, was showcased at the same time. Business Lead combines education, mentorship and internship to fast-track unemployed academically educated refugees and immigrants into business life in Finland. “Business Lead is a showcase of a private-public co-design, where companies and governmental institutions together create fast-track and significant social innovation. We are proud to showcase this during WEF”, says Marc Hinnenberg, CEO of Hanken & SSE Executive Education. Karen Spens (to the left) during WEF in Davos. NUMBER OF INTERNATIONAL APPLICANTS STEADY The Hanken Master’s programme received 454 applications from 67 nationalities in January. A total of 141 students were admitted and 41% of them holds a non-Finnish passport. We are also excited to see the effects of the Hanken Support Foundation’s newly installed scholarship, that promises 1 000 euro to all non-Finnish students who attain at least 45 ECTS within their first academic year! NEW BILATERAL EXCHANGE AGREEMENTS Hanken has signed a new bilateral exchange agreement. Our new partner is: Florida State University. THIS IS HANKEN Hanken School of Economics is a leading internationally accredited Finnish university with operations in Helsinki and Vaasa, Finland. We are one of the oldest business schools in the Nordic countries, with over 100 years experience in education and research in economics and business administration. We combine tradition with a dynamic and innovative approach to research, teaching and learning. ACADEMIC EXCELLENCE Academic excellence is at the core of everything we do. Cuttingedge research, effective research-based education and the development of global competences help our graduates manage global complexity. PARTNER PROGRAMME The Hanken Partner Programme builds long-lasting, mutually beneficial relationships that strengthen the connection between Hanken and the corporate world.